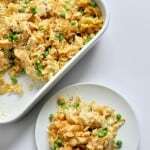 It’s the fall and back to school time so I should totally be giving you some great tips for meal planning and lunch packing but if you are like me, you might be in more need of a cocktail at this point. The easy breezy schedule of summer was met with a nice slap once the school year arrived. I feel like I can’t find my footing. 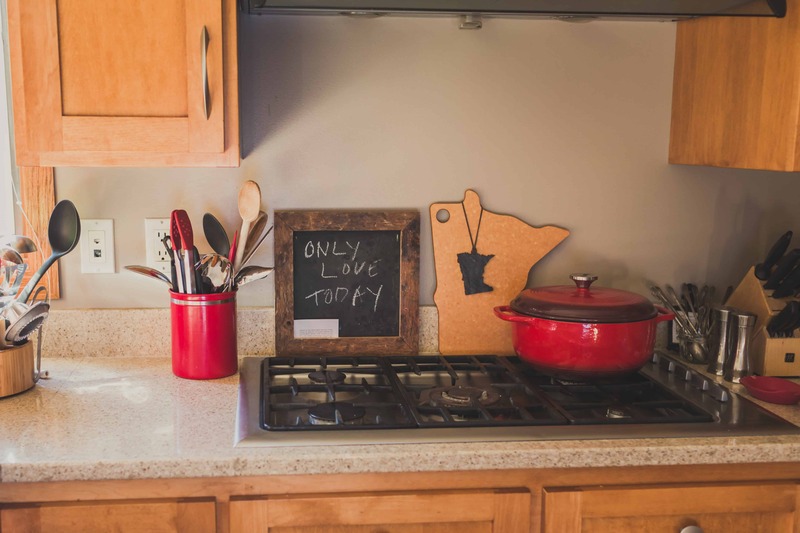 Between packing lunches, meal planning, getting the kids to school on time, getting to work and then rushing to activities in the evenings, I feel like I am spinning my hamster wheel. I’m completely exhausted by the time the kids go to bed. I haven’t been doing anything just for me. I’m just in mom survival mode right now trying to make sure the school year starts well. 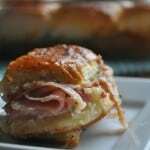 So this is recipe is something just for you. And your friends. 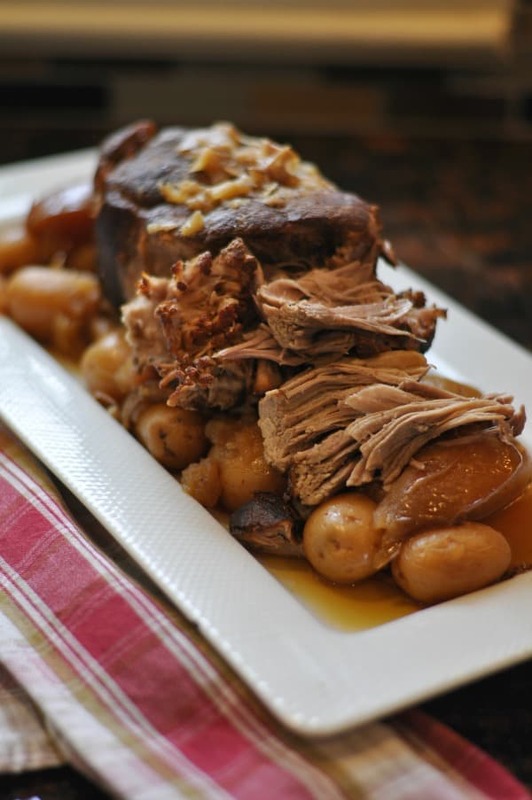 It’s served pitcher-style and perfect for fall. 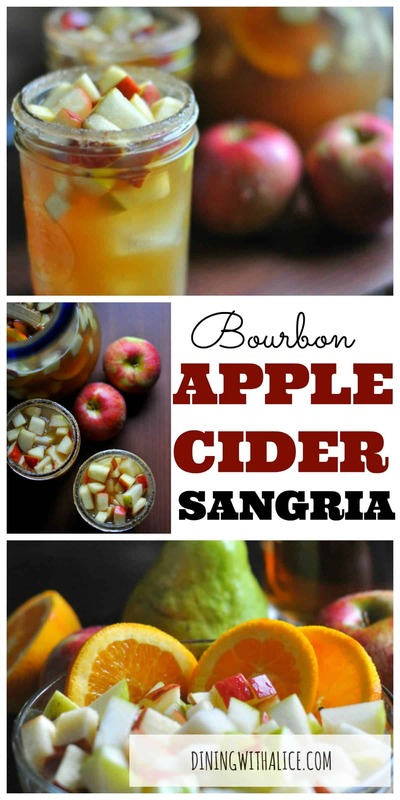 Let me introduce you to my Apple Cider Sangria with Bourbon. 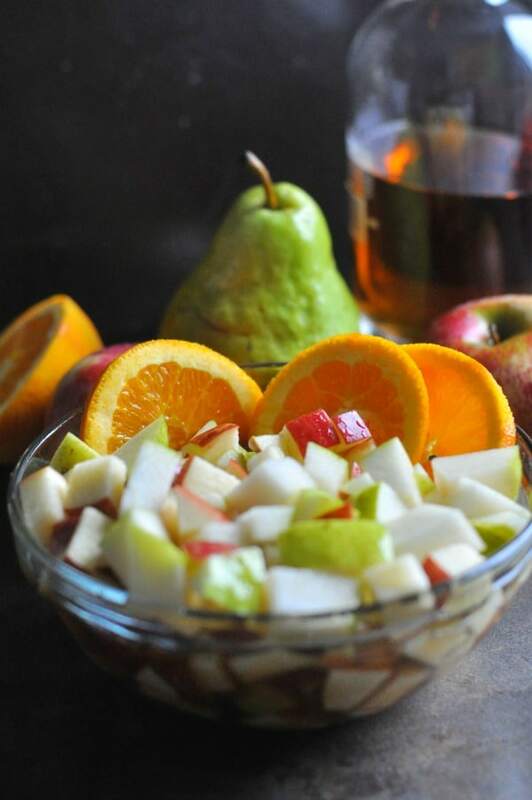 Apples, pears and oranges soaked in bourbon with brown sugar and apple pie spice. 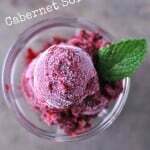 Combined with sparkling white wine and apple cider and served over ice in a sugar-rimmed glass. 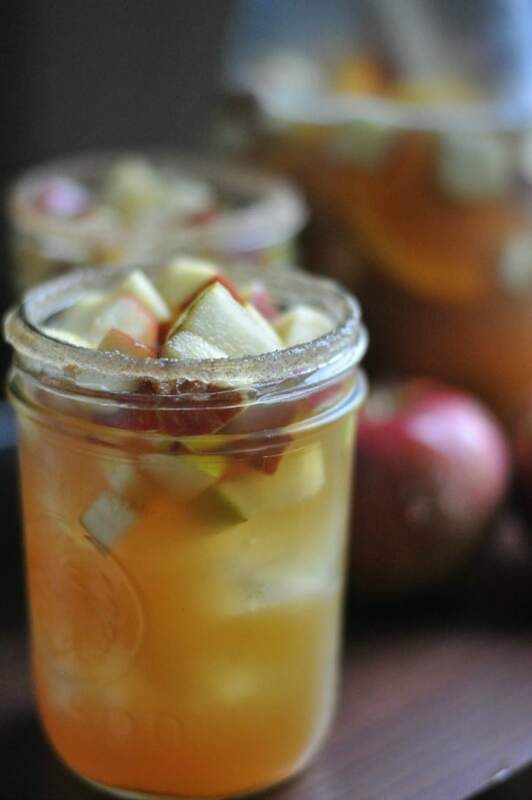 While the fall season is feeling hectic, this apple cider sangria with bourbon is the best reason you need to sit down and take a few minutes for yourself. 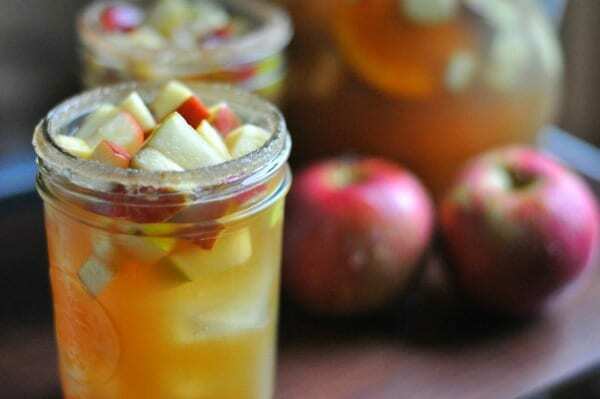 If you are headed to the apple orchard this fall, pick up some extra apples and Apple Cider just for this recipe. 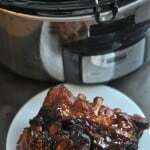 I know you’d love a meal idea too, you can use some of the extra bourbon from this recipe and make my Maple Bourbon Pot Roast in your slow cooker. Bam. Drinks for mom and a meal for the week. That’s my kind of multitasking meal planning. Cheers to me time, a good week and school year! 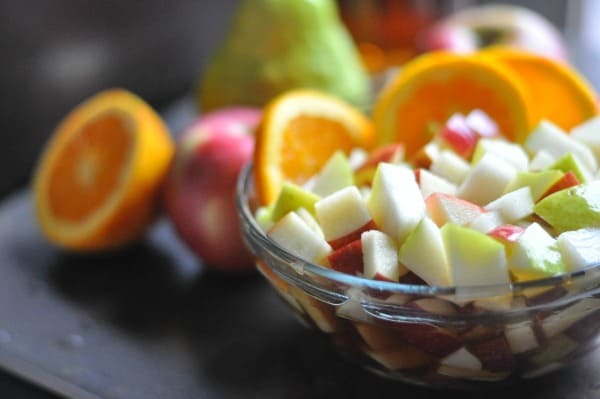 In a medium bowl, combine the orange slices, chopped pear, chopped apples, bourbon, brown sugar and apple pie spice. 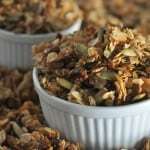 Put into a sealable bag inside a bowl and store in the refrigerator. Give at least an hour for the fruit to soak up the Bourbon. 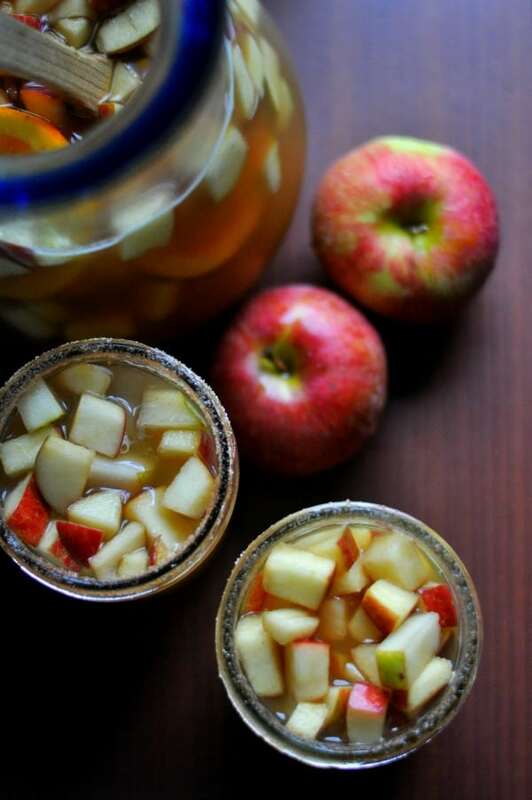 Once the fruit has soaked, in a large pitcher, combine white wine and apple cider. Add the Bourbon fruit to the wine and apple cider mixture. Serve over ice. To add a sugar rim to each glass, combine white sugar and apple pie spice in a small bowl and then put on a small plate. On another plate, put a ¼ cup of water. Dip the top of the glass into the water then the sugar. 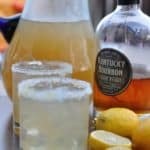 This entry was posted in Drinks and tagged apple, apple cider, bourbon, cocktails, fall, sparkling wine, Wine by Alice Seuffert. Bookmark the permalink. Your photos are so beautiful they make your mouth water for the ingredients….do you do also have the photography talent, dear niece? Is the cider supposed to be hard cider or the stuff the sell in the apple juice aisle? Hi, Tom! It is Apple Cider/Juice that you find in the juice aisle or fresh in the refrigerated section. Enjoy!